With Gylfi Sigurðsson missing yet another of the Swans pre-season friendlies – the latest a 2 nil win at Championship side Birmingham City – surely it is time for the club to draw a line under the seemingly never ending transfer saga. Whilst there is much to be admired by the stance adopted thus far by the club’s American owners in demanding a £50m fee, there comes a point when stubbornness should make way for common sense. A potential transfer kitty boosted by a £50m sale, or even £40m for that matter, would surely allow Paul Clement to bolster his squad with 2-3 quality additions and provide the squad with some much needed improvements. There is no doubting that Siggi has been a hugely important and effective player for the Swans since he re-joined the club from Spurs in July 2014, with Ben Davies going the other way as part of the deal. His statistics speak for themselves, with 42 goals and 33 assists in 182 Premier League appearances and therefore it is little wonder that the Iceman has caught the eye of numerous suitors, with Leicester City and Everton being touted the most by the media. Reading between the lines, there is seemingly a strong desire by the Icelandic international and his agent for him to ply his trade at Goodison Park. Whilst Paul Clement has spoken about the player and stated that he hasn’t asked to leave, there is no doubt his agent has been pushing for such a move – otherwise he wouldn’t be doing his job. Of course if you or I were in Gylfi’s shoes then we’d also probably be extremely interested, at the soon to be age of 28, at an increase in wages and the potential to play for the Premier League’s 7th best team – under the leadership of Dutchman Ronald Koeman. Sounds familiar to the Ashley Williams situation last August doesn’t it! Fans who watched the Swans week in, week out last season, will have noticed how frustrated a figure Sigurðsson cut during the latter stages of the season – not to mention the occasions when he occupied the left wing position! Far better tacticians and football experts than I can speak about Gylfi’s role in the team and whether or not his “position” was based on ensuring that he was accommodated in the starting eleven – given his undoubted quality and necessity to the struggling Swans (at the time). But lets face it, when a team pins its hope of success on the shoulders of a single player – which seemed to be the case last season with Sigurðsson – then for me that is a risky strategy, however good that player is. 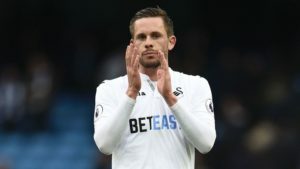 The truth of the matter is, if Gylfi wishes to play elsewhere, then let him go because keeping a player against his will (regardless of the fact that he is an employee of the club) will not be healthy for team spirit and would actually do more harm than good. Whether we like it or not, very very few clubs will hang on to players when faced with that conundrum. The disappointing thing is that the longer the Gylfi transfer saga rumbles on, the less time it gives the club to complete deals with potential targets such as Spaniard Jonathan Viera and out-of-favour Valencia forward Alvaro Negredo. It also means that any selling club will hold out for more money given the Swans apparent £50m kitty. On the field matters would also suffer, with very little (if any) time available to get any new signings integrated into the team and style of play prior to our opening Premier League fixture at Southampton on August 12. So I’m sorry to say it is time to say goodbye to Gylfi and pocket the £40/£45m/£50m on strengthening the team with players that we need. I’d sooner lose one star player (who seemingly wants away) and invest the monies received in several key acquisitions. This would give Paul Clement’s squad a much more balanced and arguably effective team from which to improve on last season’s flirtation with relegation. I’ve never been very good at predicting anything, but I wouldn’t be at all surprised if the Swans sell Gylfi to Everton after July 31, when the 2016/17 financial year end for Swansea City Association Football Club will have passed.